The SimulScope™ allows physicians and students the ability to hear live physiological sounds with up to 20 other people at the same time. The SimulScope™ provides less intrusion on patients as only one stethoscope is placed on him or her. It is also effective in the simulation lab or classroom when used with simulators or manikins. Changing from low frequency to high frequency is easy with the SimulScope™. Landmarks are provided on the unit to indicate best settings for both heart and breath sounds. This FDA approved product is popular in both universities and hospitals. Bedside Instruction - Students hear real life scenarios with minimal discomfort to the patient. Saves the Instructor time on rounds as every hears exactly the same sounds at the same time. Less Patient Intrusion - Only the stethoscope of the SimulScope™ will need to contact the patient. Physician and student interaction with the patient takes less time and can be more effective. Classroom Instruction - Sounds can be recorded at bedside and played back in the classroom. Also classroom use of the SimulScope™ with manikins and simulators can be very effective. 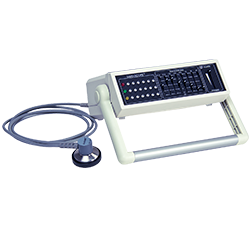 Excellent for Telemedicine - Used with a Tandberg, Polycom, VTEL, life Size, or SONY system, the SimulScope™ will send or receive heart and lung sounds over high quality telephone lines or live over the internet.